It’s time for a travel log of adventure with me! Sunday, May 26, 2013’s day of adventure featured panning for gold, white sand lake beaches, a lucky stone pile, and of course, food. For the Memorial Holiday Weekend, I flew to Atlanta, Georgia to visit my parents, Matt and Julie, and sister, Sara, for my Dad’s 50th Birthday. I had arrived Saturday evening, had dinner with everyone at a Chepe’s Mexican Grill, and went home to sleep. The Sunday started with breakfast at Lazy Bear’s BBQ (3008 McEver Road, Gainesville, GA). The humble restaurant is owned and operated by the husband and wife dou, Bear Sloan and Sue Reed. The two were featured on the 2012 Georgia Champion episode of Destination America Channel’s program, BBQ Pitmaster’s. My family are regulars there and it’s obvious why: friendly service, family atmosphere, and inexpensive and delicious food. After breakfast and my sister and I getting birthday supplies, we went to Consolidated Gold Mine (185 Consolidated Gold Mine Rd, Dahlonega, GA). Consolidated Gold Mine is one of the few gold mines safe enough for tourist. There’s even gold to be mined there still, however, the cost of extracting the gold from the mine exceeds the value of the gold. We saw the the “Glory Hole” where a huge deposit of gold was found, original cart rails and equipment, and traveled through underground caves. In addition to the 40 minute tour, we took part in the gold panning, where I found three tiny flakes of gold, and gem stone mining, where we shifted through sand for pretty rocks. After the gold mine, we drove through downtown Dahlonega and took a mountain road to Stone Pile Gap. The pile of stones marks the grave of a Cherokee princess, Trahlyta. Custom arose among to drop stones, one for each traveler, on her grave for good fortune. We travelled back to the downtown area where I got some fudge at the candy shop, The Fudge Factory (8 North Park Street, Dahlonega, GA). They specialize in handmade Southern confections and hand-dipped chocolates. Yum. 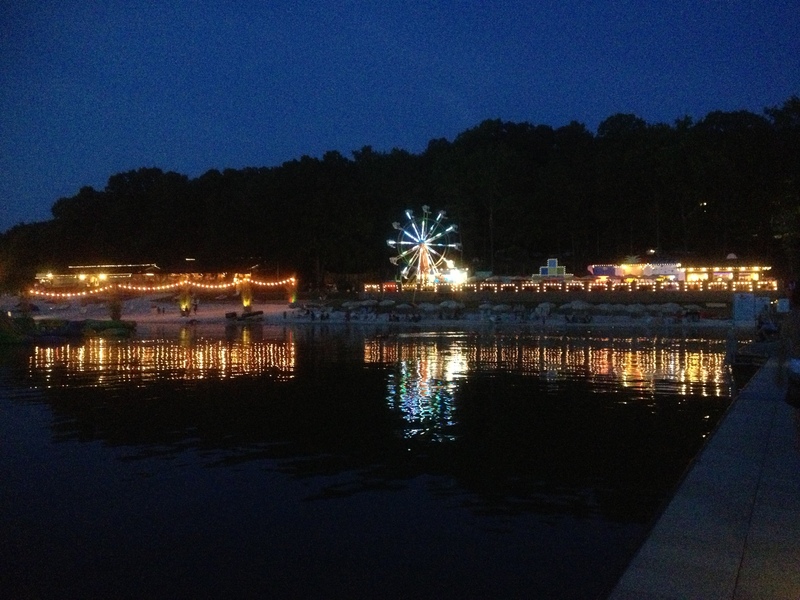 The last place for the day was Lake Lanier Islands Resort (7000 Lanier Islands Parkway, Buford, GA) for their Full Moon Party. I’ve described Lake Lanier as a water theme park on a lake with a resort and championship golf course. It’s a fun place with a wide variety of activities for children and adults. I played mini-golf with my sister. Of course, I won (I’m not going let my sister beat me), but she got two hole-in-ones while I didn’t get any. Yes, this was all done in one day. There are more days to talk about so come back.